We have officially left Lake Huron! We left at about 6:30 this morning to get to Sarnia. We had an excellent forecast and were actually able to sail the whole way (we had some help with the engine towards the end – otherwise we’d be over in the US somewhere). It sure makes a difference when you are going with the wind rather than going against it! Just before we crossed under the bridge, a huge racing sailboat went past us – it was very impressive! 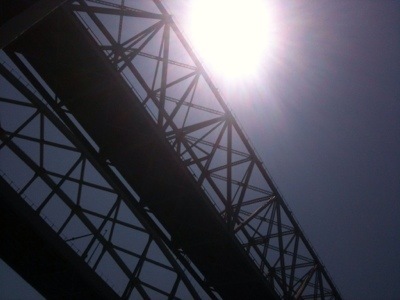 We crossed under the bridge at around 3:00. Here is a picture of it as we raced past. We headed down the St. Clair River to the Sarnia Bay Marina, called them on the radio (they actually answered) and proceeded to our slip. We both just about had heart attacks when the depth meter read 3 foot 6 (our boat has a a five foot keel). Dennis kept plowing through though and I held on tight in case of a sudden stop (there are no seatbelts available!). We made it in safely and realized that the weeds were causing the depth meter to read the such shallow depths. 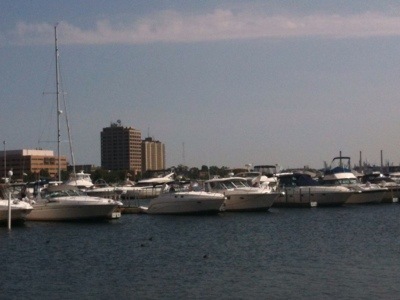 The marina is very urban – no more quaint little places anymore – we are city boaters now! It seems odd to be on the water surrounded by factories, apartment complexes, sirens, and lots of car traffic. We are very close to the Bluewater Bridge though and Sarnia is a big city. 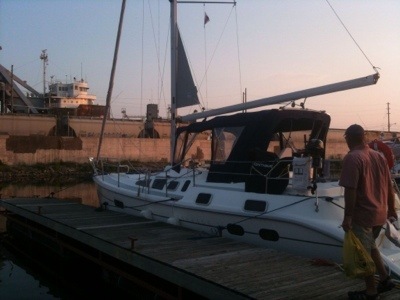 We might anchor tomorrow night or we might keep going to Windsor. The St. Clair River won’t take long – there is quite a current! Reminds me of the Mississippi! Anyway, we’re off tomorrow but we’re leaving at a respectable hour: 10:30 or so! We left Goderich at 9:00 this morning after I had gone for my jog in the heat along this great hiking/biking path. We will have to go back to Goderich in the fall when it is cooler and ride our bikes around so that we can fully appreciate it. 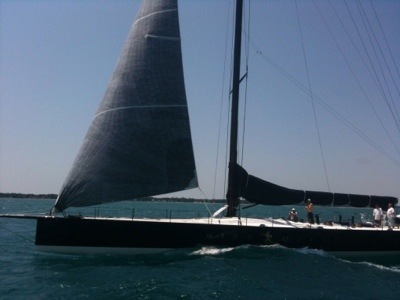 The wind was coming from the north – 10 knots – so it was good sailing. We just drifted down the lake and took turns jumping into the water. It was so nice to cool off! We arrived in Bayfield at around 1:00 and called the Harbour Lights Marina several times on the radio and on the phone but they weren’t answering. I had made reservations the day before. We went quite a ways into the river and the channel got more shallow and more narrow and we still hadn’t heard from the marina. We circled a few times but Dennis didn’t want to go further in just in case it would be too hard to come back out. 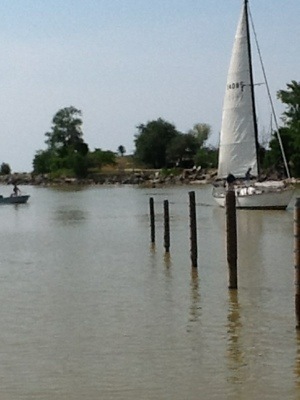 We then called the other marina – The Village of Bayfield Marina and they answered right away, so we promptly docked there. All in all, this is a better marina for several reasons: they answer the radio, it is closer to town (5 minute walk), we have a great breeze coming in from Lake Huron to keep us cool and Dennis can view the steady parade of boat traffic. We walked into town (five minute walk) and looked around. There are all sorts of interesting shops – very artsy place. I found a sports store and am getting a new bike computer installed later on as my old one stopped working. Dennis went to Bayfield Marine but didn’t find much. All in all though, this is a very good place to stop. The above picture is of a boat coming in under sail. 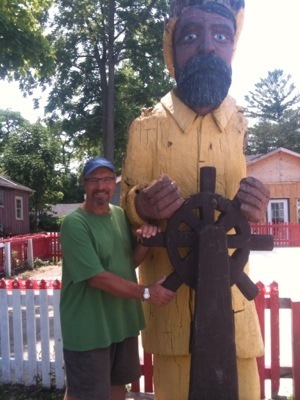 Of course when Dennis was at Bayfield Marine, he heard all about it. The boat lost its power so had to sail in. It worked out well all things considered. Another small powerboat must have run out of gas, because we saw a guy swimming and pulling the boat to the dock. No paddles, I guess! 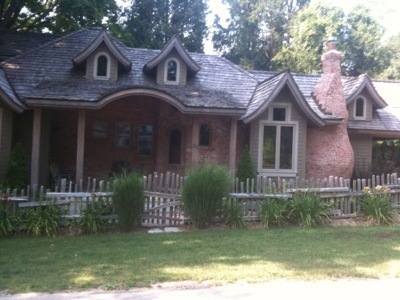 This last photo is of a house in Bayfield – pretty cool! 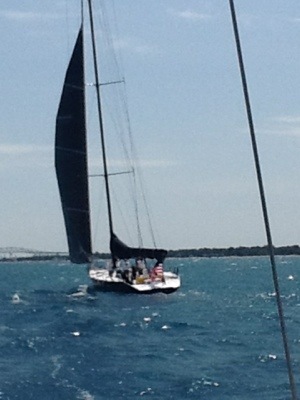 We are off to Sarnia tomorrow – the wind is supposed to be good but it will be a long day. We have 50 miles to cover but the weather looks perfect! Our trip from Kincardine to Goderich was very pleasant and uneventful. The weather was beautiful on the water. 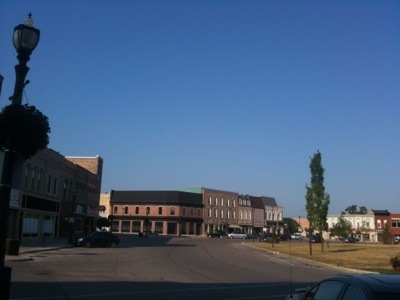 Once we got into Goderich though, it was very hot and we decided to actually use the AIR CONDITIONING. In order to get the cables to reach the electrical outlet, we had to turn the boat around in the slip. We did it by hand, with a few people watching and probably wondering what we were up to. It went fairly smoothly and we were able to use both electrical cords and now are sitting in beautiful cool air. Last night’s sleep was wonderfully cool and if we ever get another boat, I will insist on air conditioning. 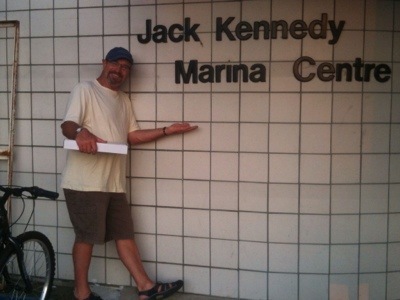 On our trip from Chicago to Mobile, Alabama, we did not have this luxury and it was unbearable along the rivers. Anyway, I have learned my lesson! Goderich is billed as the “prettiest town in Canada” and it certainly is! The layout is perfect for someone like me (with no sense of direction) because everything centres around the town square so you cannot get lost – all the streets seem to keep leading back to the town square. The houses are beautiful, old and stately with large trees lining most of the streets. Now, last year in the summer, a tornado hit the main part of town and many buildings and trees were lost, so it is bare in some places. Apparently, the courthouse was beautiful with all the huge trees. This is what it looks like now, so it will take a long time before it looks like it used to. Our view from the boat is not that great, unless you like being near the salt mine (which goes under Lake Huron for five kilometres). However, it is very quiet and peaceful here. In order to see the town, you have to walk up the very long staircase (I guess it is part of the Niagara Escarpment). We did that after supper last night in the heat and looked pretty bedraggled by the time we staggered up to the top. Luckily, there were many different ice-cream places in the square. This morning we drove our bikes around and once you actually get to the top of the hill, it is totally flat – perfect in this heat! 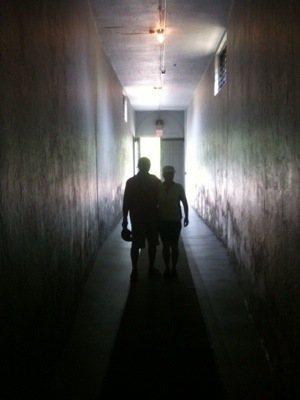 We went for a tour of the Huron County Jail and it was well worth the price of admission ($5.00). Steven Truscott was held there during his trial. He was tried as an adult at age 14. The jail is interesting but not a place that I would like to spend any time. The tour was excellent – we had these audio devices to make it interactive – just press a numbered code when you see something of interest and the audio guide tells you all about it. 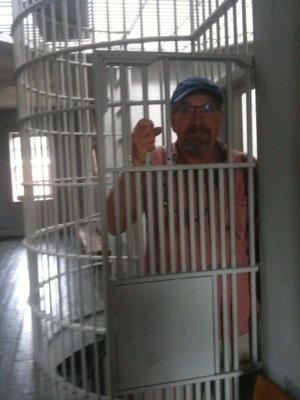 As you can see, Old Pink made an appearance in the jail! The following picture is of the entrance – very intimidating! After the jail, we went grocery shopping and now we are hoping to go swimming at the beach. 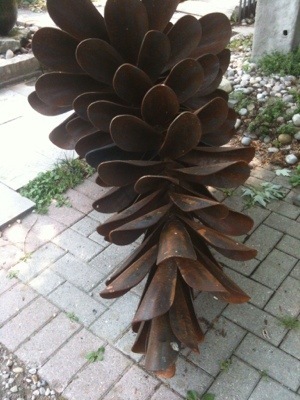 Tomorrow, we are heading for Bayfield for one night and then off to Sarnia. 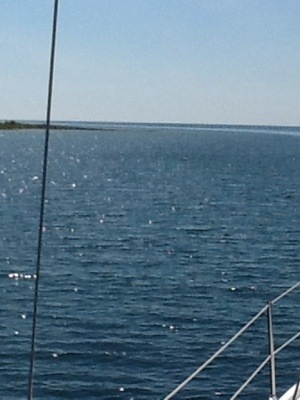 We are anchored out at Lyal Island, near Stokes Bay, somewhere at the top of the Bruce Peninsula. It is really small but very powerful. I had everything cleaned up within ten minutes. 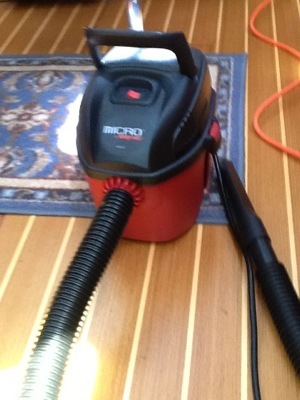 The vacuum cleaner even has a bag, and was only about $30 at Home Hardware. I think I will buy one for our house because it is perfect for quick cleanups. Dennis has gone fishing but doesn’t seem to be having much luck. I think he just enjoys going from one boat to another! The wind is supposed to come up from the south at midnight which won’t be good for tomorrow’s trip to Kincardine. However, the forecasters have been wrong before. It is very quiet here and the weather is perfect!